You may often hear about the blood of Christ. There are many hymns about the “blood of the Lamb” and similar wording is sprinkled throughout many sermons. So what is the significance of the blood? To answer this question we need to go to God’s Word. In Romans 6:23 we find that the “wages of sin is death…” (eternal separation from God, in Hell). That is because God is righteous and cannot (in His righteousness) allow anyone who has broken His perfect law (sinned) to avoid these wages that He owes them. If He did, He would not be righteous. He would be unjust Himself. While God is loving and forgiving, He never exercises one attribute at the expense of another. He is ALWAYS just. He loves all and wishes that none perish (2 Peter 3:9), even though many will. He is always forgiving through, and ONLY through, the satisfaction of His justice. He never sets aside justice in order to forgive (Isaiah 45:21 – Zechariah 9:9). The way in which God satisfies His justice, is by paying the wages of death, either to each individual sinner, or to a Perfect Substitute. Jesus Christ is the only acceptable, perfect, Substitute. A sinner must have Him, must receive Christ, or stand defiled and dead in his sins! Only by having Christ (John 1:12) (and His blood sacrifice) can one have eternal life. In the beginning chapters of the Bible (Genesis 3:21) we find the very first animal sacrifice. God clothed Adam and Eve with coats of skin. The fig leaves that they used to cover themselves (the first act of self-righteousness) weren’t sufficient. The curse was on them and there was no amount of good works that they could do to cover their sin. Their skin was covered, but God sees all. They were still naked. The blood of that animal was shed, not to satisfy God’s justice (because animal sacrifice doesn’t satisfy His justice – Hebrews 10:4) but to show Adam and Eve that their sin could only be covered by blood. This was a shadow of the coming Messiah, Jesus Christ, who’s blood is the only blood that is able to cover sin. As we are saved by the blood of the crucified, risen Savior who came, so they were saved by the blood of the coming Savior (Job 19:25-27). The requirement of blood shed (from animals) stood as a constant reminder of the necessity of the blood of the Lord Jesus Christ. In Genesis 4 we read that Cain brought an offering of the fruit of the cursed ground (Genesis 3:17) to the Lord, and God was not pleased. While his brother Abel brought of the firstlings of his flock, and the fat thereof, and that pleased God. 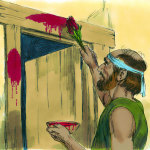 Again, we’re reminded of Hebrews 9:22 “…without shedding of blood is no remission.” Cain’s offering came from the very ground that God had already cursed, yet he expected that it would be pleasing to God. There was no shedding of blood, so there was no remission of sin. Where there is sin, there is no fellowship with God. Without the blood sacrifice a sinner stands eternally cut-off from Holy God, rejected by Him. Cain presents us with a great parallel to the religious lost of today. If you would have asked Cain, as he prepared his offering, “are you sure this will satisfy God?” His answer would have surely been “Yes, absolutely! I worked very hard and did good. If ANY offering will be pleasing to Him, mine will be.” But just like Cain, those who rely on their own righteousness and good works to save them, without fully trusting in Jesus Christ alone, will be very disappointed on judgement day. They will find that they were never saved, because they relied on themselves (cursed mankind) to be justified, instead of relying on the blood that was shed at Calvary by the Lord Jesus Christ to justify them. In Exodus 12 we read of the Passover. The pascal lamb (a picture of the Perfect Lamb, Jesus Christ) had to be slain. But the slaying alone didn’t cover their sins. Any household that did not apply the blood of the lamb on their door posts, would receive the judgement. In the same sense, if the blood of Jesus Christ is not applied to our hearts, “sin lies at our door” (Genesis 4:7) as it was at Cain’s door. This would leave us “condemned already” (John 3:18). Throughout the entire Old Testament we read of blood being shed to establish covenants. We read about blood being shed to have fellowship with God. We read about blood being shed to reconcile and sanctify individuals, and an entire people, with/to God. The necessity of blood is one of the most fundamental and necessary truths of God’s Word. Without an understanding of the necessity of blood, the Gospel cannot truly be understood. Thus men tend to rely on their own obedience in order to justify. This leads to eternal damnation. We are either saved by the blood of Jesus Christ, the Perfect Lamb, or we are condemned to hell forever. If our own righteousness and obedience are what determines our salvation, we will all surely go to Hell. “There is none righteous, no, not one” (Romans 3:10). The Blood of the Perfect Lamb, Jesus Christ, has power to justify (Romans 5:1,9), reconcile (Colossians 1:20), cleanse (1 John 1:7), sanctify (1 Corinthians 6:11, Hebrews 6:1), eternally redeem (Hebrews 9:12), enable us to overcome and have victory (Revelation 12:11), give us access to God (Ephesians 1:6-7), and to give us assurance from God (Ephesians 3:12, Hebrews 4:16). There is no approach, fellowship or enjoyment of His favor, apart form the Blood! But there is infinite, indescribable and incomprehensible power in the blood of the Lord Jesus, the Perfect Lamb! Power to justify. Power to sanctify. Power to regenerate. Power to forgive. Power to cleanse and power to overcome anything that we’re dealing with. The Lord Jesus Christ became sin for us (2 Corinthians 5:21) and died in our place! In order for the blood to be applied, we must take Him at His Word (in our heart, not just our head). This always includes repentance. We must simply believe Him, that His blood wiped away all of our sin, past, present and future! “It is finished” (John 19:30)! “A guilty weak, and helpless worm.